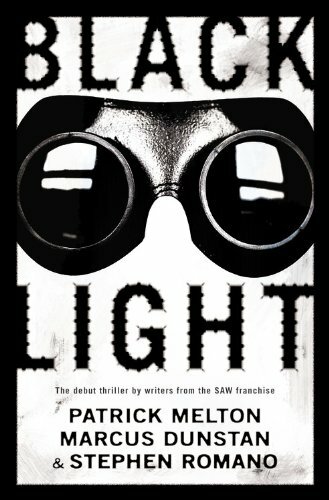 Black Light is the first novel written by the guys who wrote the later (IV, V, VI, 3D) Saw movies - Patrick Melton, Marcus Dunstan, and Stephen Romano. If you have a supernatural problem that won't go away, you need Buck Carlsbad: private eye, exorcist, and last resort. Buck's got a way with spirits that no one else can match. He was normal, once. Until Something Horrible killed his parents and left him for dead. Buck has spent years using his gift to trace his family. It's his only hope of finding out what happened to them-and what made him the way he is. Now the voices say that something big is coming. Buck already knows what it is-a super high-tech bullet train running express across a stretch of unforgiving desert known for the most deadly paranormal events in history. A place where Buck almost died a few years ago, and where he swore he would never return. But as the train prepares to rumble down the tracks, Buck knows it can only be the inevitable hand of fate pulling him back to the most harrowing unfinished case of his career at four hundred miles per hour. Black Light is a ghost story unlike any other haunted tale I have read. Buck earns his living as a ghost whisperer of sorts. Instead of gently leading them into the light, however, Buck pretty much chews them up and spits them out. 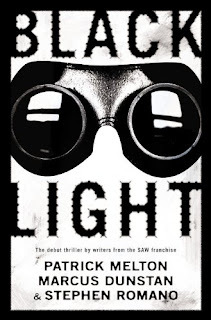 When Buck gets an offer to eliminate spirits on a hyperspeed train, he knows somethings not right, but he can't pass up the chance to get more answers about his past from the Black Light. Like the hyperspeed train itself, Black Light is an intense experience with non-stop action. I enjoyed reading this supernatural thriller and really appreciate its originality. Interesting, writers from Saw hey, I'm completely intrigued. ack it is super scary? Hmmm... I'm thinking this may not be for me. I like ghost whisperer but I'm not sure about this kind. I'm also kind of scared by the fact that he wrote some of the Saw movies. Oooh I think I need to add this one to my TBR!!! alana - I think people will find it to be scary, yes. Surprisingly (since it's from the Saw writers) it's not a gory read. Books very rarely scare me. Real life and TV/Movies I can be a total chicken, but it takes something special from a book to scare me. I think those who get scared while reading could get scared from Black Light. I just met the authors at ComicCon and I'm looking forward to reading this.